Do you want to learn how to create beautiful signs using stencils? Today I’m going to help you achieve that goal. You don’t have to be artsy or crafty, just patient. That to me is the key to using stencils. My daughter is in love with unicorns. 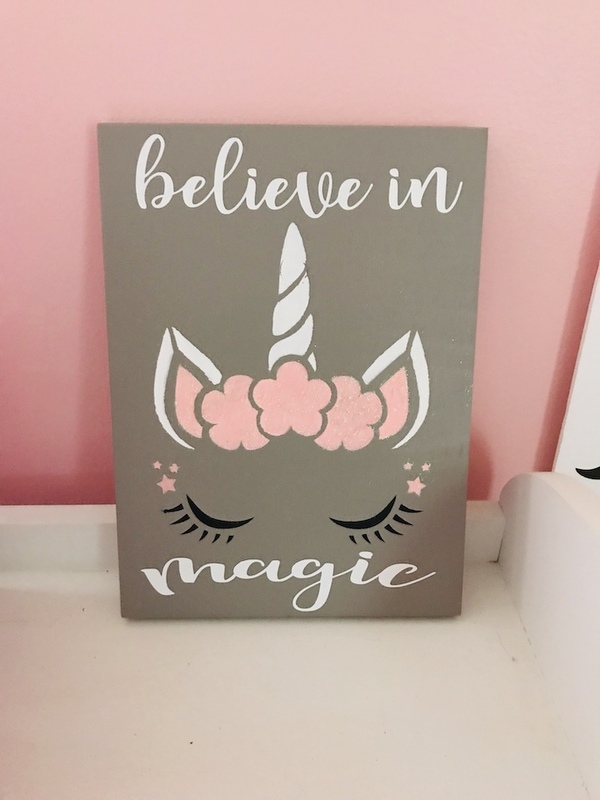 I’m going to create a believe in magic unicorn sign for her room. 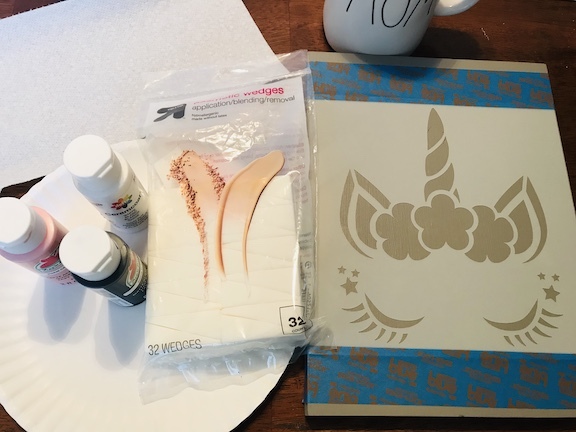 I’m so excited to share that I had the opportunity to work with Stencil Revolution and was given the stencils to use for this post. All thoughts and opinions are my own. At Stencil Revolution you can find stencils of all kinds. Animals, farmhouse, sayings, wall patterns and they even have cookie stencils. Cookie stencils look really cool, I might have to try those. I also received a “You are My Sunshine” stencil, this will make a great sign for my mom’s garden this summer. If you are a beginner, I would recommend using a smooth board. Stenciling on rough wood can be challenging. For this project I’m using a piece of common board that we had in our scrap wood pile. It was meant to be because it’s the perfect size for this project. To get ready for this project, I painted the wood piece grey a few days before stenciling on it. I originally wanted to do my daughter’s nursery in pink and grey, but so many people told me it wasn’t girly. I personally love the color combination. 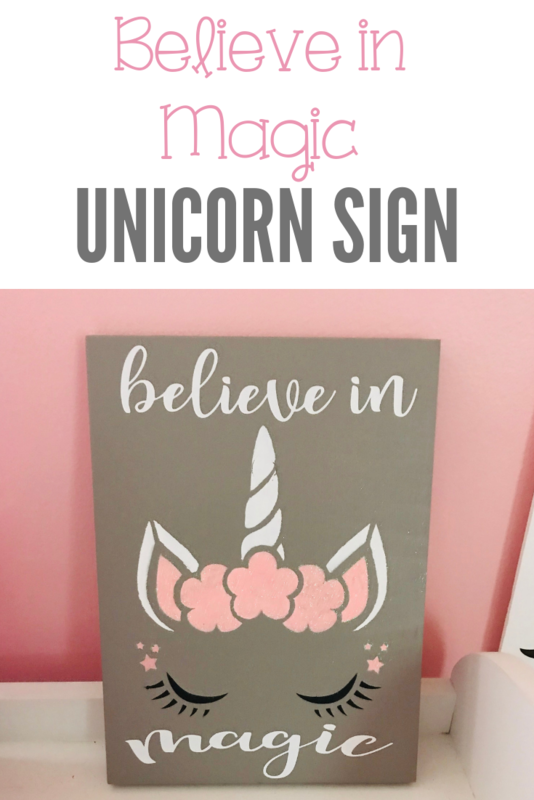 When I went to make the unicorn sign, I knew the grey would be perfect and it matches her pink walls perfectly. My daughters room is still decorated as her nursery, but as she gets older we will change it, but I’m adding pieces here and there. She has a deep love for horses and unicorns. To stencil, I like to use makeup wedges and dab slowly with hardly any paint. You will gradually add more paint as you add more layers of color. It’s been along time since I’ve stenciled with an actual stencil. I usually make my stencils with my Cricut using removable vinyl. I think next time I will have to change up my technique a little bit when using an actual stencil. It’s not perfect (I’m my toughest critic), but it’s homemade with love. The stencil worked great, it stayed in place and washed up nicely. I highly recommend them. This was my first time adding glitter to a sign, but this won’t be my last! Even though I’m still wiping glitter from the sign because we all know glitter goes everywhere, the sparkle is magical. 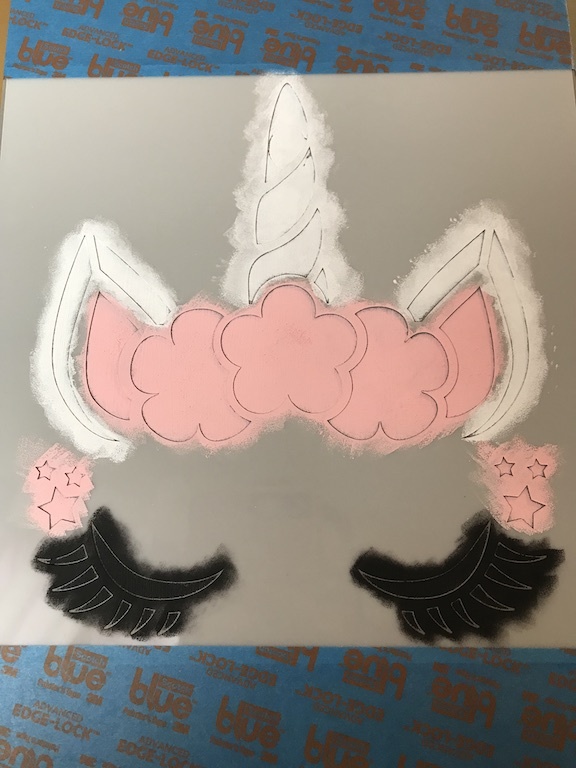 After the sign dries, apply mod podge to the areas you would like to add glitter and add the glitter. Unicorns are magical creatures and we should never lose the wonder or the belief in magic. In vinyl I added Believe in Magic onto the sign. My daughter is in love with it. She said “I love unicorns!” and then ran around like crazy yelling unicorns. That’s a sign of love. 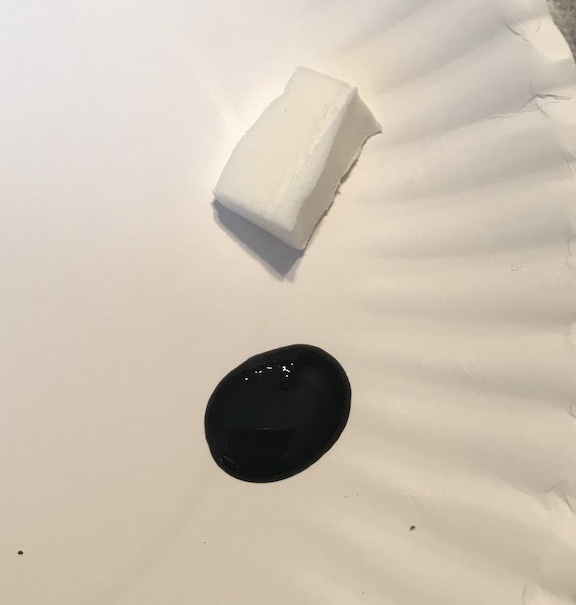 Kids are so funny. It sits perfectly on her dress up storage. Hi I'm Jenny from Cookies, Coffee, and Crafts. 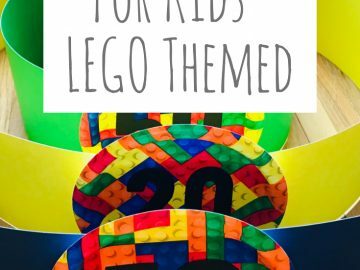 I love to create decorations for my home, projects to create magical holidays, and to have fun with my kids. The quote "I run on coffee, chaos, and crafts" describes my world and I wouldn't have it any other way. I hope you find inspiration and enjoy my creative journey. Come along on a journey with me as I create magical moments crafted with love. If you would like to receive our weekly newsletter, please subscribe with your email. Let's Create-Make-Celebrate! © 2017 Cookies Coffee and Crafts. All right reserved.